Twin Filaments: Tungsten, Thoria-coated iridium or Yttria coated iridium. SSIG-17,SSIG-18 and SSIG-19 are new, improved Bayard Alpert ionisation gauges specifically designed for long life and reliability. As well as using high specification materials, the surface area of the grid structure has been reduced, and the collector plus collector shield are of an improved design. Compared to standard BA gauges, these improvements mean that the SSIG17/18/19 has a lower x-ray limit that enables pressure measurement down to 3 x 10-11mbar. At higher pressure operation (up to 10–2 mbar), the rugged, robust characteristics of the gauge construction ensure a long-life of reliable, repeatable pressure measurement. Whatever the application, the very competitive price of the SSIG-17/18/19 ion gauge make it a must for all vacuum systems. 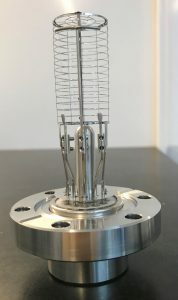 A hot cathode ionisation gauge comprises three electrodes: a filament, grid and collector. Electrons are produced from the filament by thermionic emission. A positive potential on the grid attracts the electrons away from the filament, causing them to oscillate through the fine structure many times, until eventually they collide with the grid. Alternatively, the electrons collide with gas molecules producing a positively charged ion, which are collected at a negative electrode (Collector) at the centre of the grid structure. The current depends upon the number of ions which is directly proportional to the pressure in the gauge. The low pressure limit of the gauge is restricted by the ‘x-ray limit’. Electrons hitting the grid produce soft x-rays which in turn produce photoelectron emission (‘photoelectric noise’) from the collector. Since the measurement electronics cannot distinguish between collecting a positive ion or losing a photoelectron, a theoretical minimum detectable pressure is set. The effect is small and it kept to a minimum by careful design of the gauge. To connect a SSIG-17/18/19 ion gauge head to a controller, a lead is required. Bakeable leads are available for all three gauges, which means that the gauge can be operated (and pressure monitored) whilst the system is being baked. Also, the gauge heads can be degassed whilst the system remains hot. The standard lead is 3 meters long but any length can be supplied to order. Ionisation gauges have different sensitivities for different gases and are usually calibrated for nitrogen. Many users accept the inaccurate pressure measurement for a gas mixture and rely on the long-term reproducibility of the gauge. For accurate pressure measurements the gauge head should be calibrated for the gas species being measured. RS232/485 interfaces. Full computer control via MODBUS or (ASCII-based) QueBUS multi-parameter messages. USB/Ethernet option. Free VacTools software for data logging, graphical display and control. Ion Gauge: 1x UHV, dual Iridium-based filament. Yttria or Thoria-coated filaments. Filament Drive: High stability, low noise, constant current dc. Degas Features: User-defined ramp/soak periods. User-defined pressure suspend to allow vacuum recovery. Bake-out Functions: 6x ramp/soak steps, each up to 99.9 hours duration (0.1 hour resolution). Individual trip allocation for power switching (e.g. 3 trips for 3Φ).User-defined pressure and digital input interlocking (ramp suspend/time suspend/abort).User-defined temperature hysteresis.Auto-degas at end of bake-out. Digital Inputs: 2x opto-isolated inputs. 3-30Vdc; 2.4kΩ input resistance. Display Resolution: Ion gauge: Pressure: 1 or 2 decimal place resolution. Ion current: auto-ranging 4 significant figures. Secondary gauges: 1 decimal place resolution. Temperature: <0.1°C measurement resolution, 0.1°C display resolution. 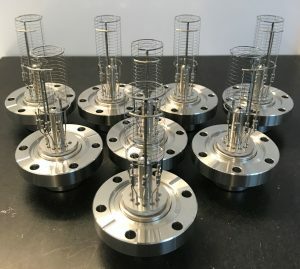 SS Scientific have the capability to refurbish ion gauge heads to an ‘as new’ performance guarantee. It is a cost effective way to extend the lifetime of your equipment. Our wealth of experience in manufacturing techniques used to produce these items is your guarantee of unbeatable quality and our many years of experience in vacuum technology ensures the high quality needed for UHV applications. We also supply exchange gauge heads to reduce down-time of your vacuum equipment. We will rebuild, clean and leak check your gauge head. The refurbishment includes new filaments (tungsten as standard) and where necessary grid, collector and barrel connectors. We specialise in the refurbishment of the VG VIG series of gauge heads, but would be pleased to quote for any other manufacturers head.